This Crucifixion by Bernardo Daddi was in a private Florentine collection and was acquired for the Thyssen-Bornemisza collection in 1972. Its provenance can be traced back to the 18th century when it would seem to have belonged to the Italian painter and collector Lamberto Cristiano Gori. It was the subject of an interesting text by Federico Zeri in 1973 following its acquisition for the Thyssen- Bornemisza collection. Zeri related the present panel to another in a private UK collection of The Virgin and Child, which he considered to be the right wing of a diptych whose left panel would be the present one. Ten years later Boskovits associated this “delightful panel” by Daddi with another, also of The Virgin and Childbut with four saints, in the Musée des Beaux-Arts, Nantes, which he suggested to be the right wing of a dismantled diptych. 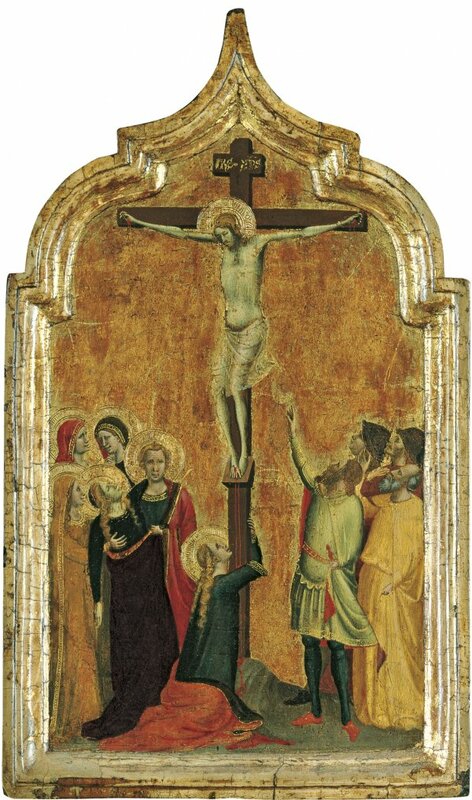 Daddi used a simple composition for this Crucifixion, which he repeated in other works with slight variants. Christ, depicted on the cross and with a halo, creates a pronounced vertical axis on either side of which are the two groups traditional to this scene. On the right, organised in two rows, are the Roman soldiers identifiable by their helmets, the centurion who raises his arm to point to the Redeemer, and a fourth individual in a yellow tunic who may symbolise the Pharisees. Daddi balances this secular and military group with a second, sacred one on the other side of the cross. Among the figures in the second group is the Virgin, depicted in profile, who has fainted in the arms of Saint John the Evangelist and is attended by one of the holy women. Also notable is the figure of the kneeling Magdalen at the foot of the cross, embracing the shaft down which Christ’s blood still runs. Her gesture emphasises one of the most dramatic episodes in the Passion. The subject matter and size of the panel connects it to works produced by Daddi’s workshop for private devotional purposes. The intimate character of these compositions, painted with brilliant, clear colours, brought Daddi enormous fame and a large number of commissions for images of this type. The panel in Nantes, which Boskovits suggested in his reconstruction, has figures of similar proportions and a comparable type of decoration of the haloes, as well as more general similarities in the dimensions of the panels and the structure of the frames. 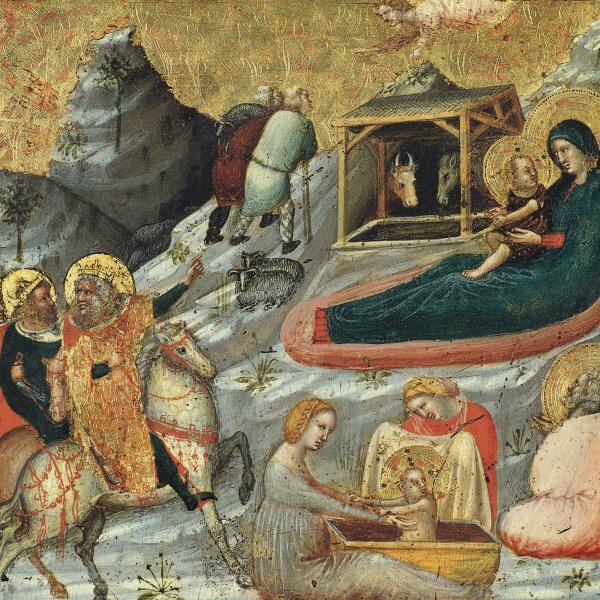 The present painting has been dated to an early phase of Daddi’s career, bearing in mind elements such as the motifs on the gold decoration, the depiction of Mary and the arrangement of the group with the soldiers, all of which are comparable to his earliest works. The panel still has its original frame.